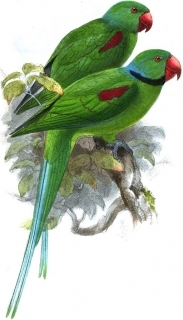 The Seychelles Parakeet was last recorded in 1881. This bird resembled the Alexandrine Parakeet, lacking the pink collar. Both adults all green in colour with red upper wing coverts and dark edging to primary and secondary feathers; black ring encircling neck; blue wash on nape and occiput. Bill red. Eye yellow. Resembled adult female, but with shorter central tail feathers. Deforestation for agriculture, shooting and trapping were the main causes of this bird's loss. Formerly Mahe and Silhouette and possibly Praslin, Seychelles Islands. In one report they were seen in forest edge along a maize field. Probably found in small groups or flocks, making conspicuous flights overhead. Birds were reported to be wary, presumably because of constant persecution.